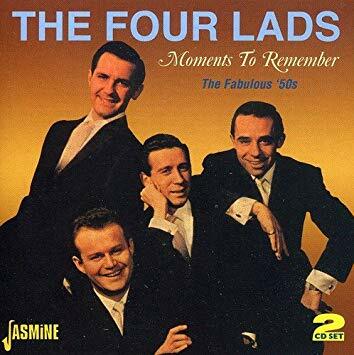 The Four Lads were a popular 50s vocal group similar to other groups especially The Crew Cuts as both groups were from Toronto. They had a few hits including Standing On The Corner in 1956. All four members attended St. Michael's Choir School in Toronto. The original members were Connie Codarini, Bernie Toorish, Rudi Maugeri and John Perkins. At first they called themselves The Otnorots (Toronto backwards) and then The Jordonaires. Maugeri and Perkins left and later formed The Crew Cuts. They were replaced by Jimmy Arnold and Frank Busseri. Their main influence was the gospel group The Golden Gate Quartet. In 1950 The Four Lads started singing in local clubs and then they went to New York. They were spotted by Columbia Records A&R head Mitch Miller. He hired them to back up Johnny Ray on his 1951 hits Cry and The Little White Cloud That Cried. The Four Lads started recording their own singles in 1952. Their first top ten hit was Istanbul (Not Constantinople) in 1953. Their biggest hits were Moments to Remember in 1955 and No, Not Much and Standing on The Corner in 1956. Standing On The Corner reached #3 on the pop charts. The song was written by Frank Loesser for the Broadway musical The Most Happy Fella. Columbia house producer Ray Ellis wrote the arrangement and conducted the orchestra. Several Four Lads hits were only released as singles until Columbia assembled them on a 1958 Greatest Hits album. This 2CD comp from Jasmine has all their hits. Of course the rise of Rock 'N' Roll was the end of many vocal groups like The Four Lads. They left Columbia in 1961 to record for Kapp, Dot and United Artists. Busseri still leads a version of The Four Lads on the oldies circuit. Here's a video of Standing On The Corner by The Four Lads.